This review was based on price, reliability, features, power consumption, form factor, and performance. This desktop is approximately the size of a hard cover book and weighs only a couple of pounds. It comes with a laptop style 45 watt power supply. This is not a power hungry machine. Replacing a significant number of older desktops with models like these will definitely save money on electricity. In addition, the mini form factor makes it a great fit on any desk. Monitors can be placed on top of the desktop to save space. It can also easily be sat between multiple monitors on a desk. This is nice because, instead of having to bend over or kneel down to insert USB devices, it’s very easy and at arms length to do so with this desktop. There is no downside here. This machine comes with 2 Display Port outs integrated with an optional 3rd output as a riser card. That means this tiny desktop can power 3 monitors using Display Port cables. Display Port cables are by far the best monitor cable connections in terms of features and capability. Where some may find this to be a downside is that if your monitors don’t have Display Port connections (unfortunately, many don’t), you’ll need to buy adapter cables. Also, there is no VGA out on this computer. You will not be connecting these things to any archaic analog junk. To have such a small machine be able to power 3 monitors via Display Port is massive plus for the digital connoisseur crowd. If you’re going to purchase one (or more) of these machines, make sure to get monitors with Display Port ins to go along with them. Just as with the laptops, this machine with it’s small size can make it an inviting target for theft. It has an integrated TPM chip to make hard drive encryption very easy. Without getting too technical, the TPM remembers the encryption key for the user eliminating the need to make changes to the Windows Operating system and enter an additional password at start up. Make sure you get one with Windows 10 Pro to take advantage of this feature. I’ve said it before and I’ll say it again. SATA hard drives are obsolete. NvME hard drives are the way to go. This is a feature that’s well worth paying for. It doesn’t even add that much to the price. SATA drives are capped at about 550MB/s read and write (and those numbers are with the absolute best equipment). NvME drives can far surpass those numbers. The single most important feature that an average user will benefit from is a fast hard drive and these things fly compare to SATA drives, even traditional SSD’s. Not that this is an earth shattering feature, but at this price point, along with everything else these machines offer, the fact that you get the flexibility/redundancy of both onboard wireless AC but also wired Ethernet connection options, not only eliminate the single point of failure but also just make this low cost machine that much more versatile at this price point. HP really knocked it out of the park here. These machines open up by just flipping a switch. Totally tool-less, you can be under the hood in a split second. Adding RAM, swapping a hard drive, adding an additional hard drive, all are extremely easy with this form factor and set up. You couldn’t ask for an easier machine to work on that this. Great for IT guys! Really the only cons with this are that, it’s not powerful enough for power users. Graphic designers, 3d architecture, CAD, etc. will have to look elsewhere. This is a machine for lawyers, accountants, office staff, tradesmen, nurses, print shops, etc. Really the only other knock on this machine is the fact that the only audio out port is the front headphone jack. This is a knock because even in order to hook up speakers, you have to run a cable coming out the front that then go around back. It just takes an elegant clean package and makes it ugly. Almost every one of these I deploy ends up powering external speakers and has an ugly cable management situation as a result. It’s really not a huge deal, but with this machine being so close to perfection, I just with that one issue could be rectified. 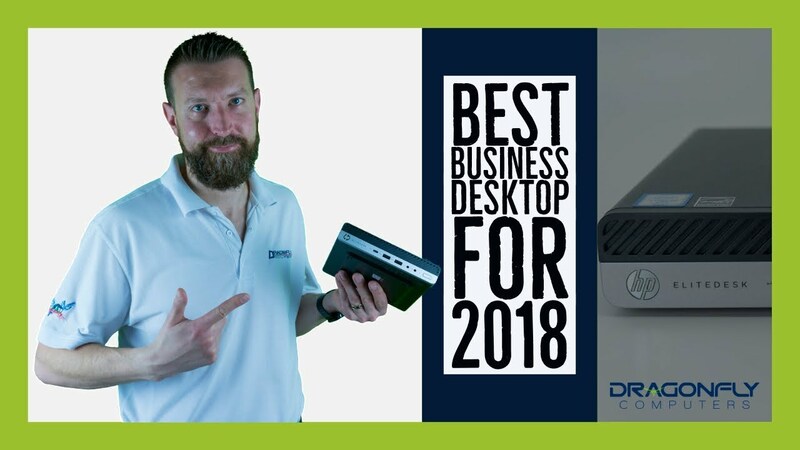 In closing, I rated the HP Elitedesk 800 G4 as the best business desktop for 2018 for a few reasons. It’s got everything you need with nothing you don’t, it’s not expensive, it’s a machine that will continue to perform admirably as the years pass due to the hardware it’s packing, it’s takes up no room on desk and uses little electricity, and basically, it just works. This is a great buy for about 95% of office staff who need a glorified word processor that can browse the web, check email, and run accounting software. (I don’t make any money off this). Read our Best business laptop for 2018 review here.